Pope Francis delivers his message during the Angelus noon prayer in St. Peter's Square at the Vatican, Sunday, July 22, 2018. Pope Francis has lamented the latest migrant deaths in shipwrecks of smugglers' boats and entreated nations to act swiftly to prevent more tragedies. 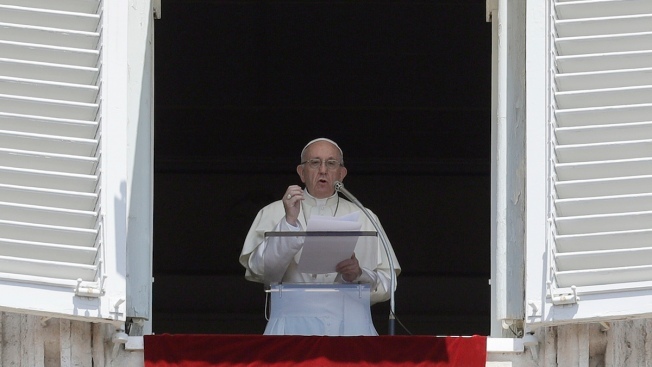 Francis in his traditional Sunday appearance to faithful in St. Peter's Square expressed sorrow over recent deaths in the Mediterranean Sea and assured victims' loved ones of his prayers. He called on "the international community to act decisively and quickly so similar tragedies aren't repeated" and said the "safety, respect of rights and the dignity of all must be guaranteed." Far fewer migrants have arrived in Italy this year compared to the same period in 2017, but U.N. refugee officials say recent crossings have been deadlier. With Italy's new populist government and Malta not allowing aid groups' boats to dock, rescued migrants lately have been stranded at sea for days.